UKEOF has formed a Citizen Science Working Group to provide a forum where member organisations can share good practice and discuss future needs and plans for working with volunteers to provide high quality, environmental observation data. As part of regular citizen science working group, members provide updates about their organisation' initiatives to inform the wider community of areas of work or planned events. Building on the success of the UKEOF commissioned citizen guide (NERC's Centre for Ecology & Hydrology (working with the Natural History Museum)) in 2012 , the group is currently advising on two recently commissioned contracts outlined below. UKEOF commissioned The University of Reading to undertake a study to investigate people's motivations for citizen science. Citizen science is widely acknowledged to have a potentially important role in delivering valuable environmental data at local to national scales. However, without an understanding of why and how people participate in citizen science, some initiatives could miss their mark and fail to provide the expected benefits. These social drivers of evidence-gathering by citizen scientists are often overlooked in favour of discussions around the need for and quality of the resulting data. UKEOF wants to balance this with an approach based on social science so that we can understand the personal needs, motivations, benefits and barriers which affect participation in citizen science, both in terms of the volunteers themselves and other involved parties such as the scientists, policymakers and data users. In September 2015, UKEOF commissioned a study to investigate people's motivations for citizen science. This study aims to improve our understanding of motivation and participation in citizen science, so that new initiatives can be designed to take these factors into account, making them more likely to succeed and easier to evaluate. The contract was awarded to Hilary Geoghegan at the University of Reading, along with Alison Dyke, Sarah West and Rachel Pateman at the Stockholm Environment Institute at the University of York, and Glyn Everett at the University of West England. Keep an eye on our Twitter feed for updates on the project. UKEOF has commissioned WRc plc to undertake a study towards a methodology for evaluating opportunities, costs and benefits of citizen science. The UK has a long history of volunteer monitoring in the environment which has tended to focus on schemes that supplement existing monitoring effort. More recently, as monitoring agencies face significant financial pressures, there has been an increasing interest in volunteer involvement across a wider range of monitoring activities, allowing employed staff to be deployed more flexibly, and citizens to participate in stewarding key aspects of their local environment. Volunteer involvement can incur significant costs through design, IT support,recruiting, training and engaging with volunteers, and analysing data. However,in some cases, such engagement may be the most cost-effective option and provide an increased contribution to UK monitoring. However, despite evidence that volunteer monitoring can represent good value for money, presenting a financial case to secure necessary resources to support,recruit and engage volunteers remains difficult. In October 2015, UKEOF commissioned this short study towards a methodology for evaluating opportunities, costs and benefits of citizen science. The study builds the understanding about how to identify and measure the costs and benefits of monitoring activities using volunteers, explains the main principles involved, in a way which will be of practical use to the UK’s environmental protection, monitoring and conservation agencies. The contract was awarded to Anne Phillipe, Ralph Blaney, Andrew Davey, Sarah Clist all based at WRc plc, along with Michael Pocock from Centre for Ecology and Hydrology and Glyn Jones at FERA. Keep an eye on our Twitter feed for updates on the project. UKEOF commissioned NERC's Centre for Ecology & Hydrology (working with the Natural History Museum) to carry out a project looking at the role of volunteers in environmental monitoring, resulting in a step-by-step Guide to Citizen Science, providing evidence-based advice on how to set up and run a successful citizen science project. The project also looked at lessons learnt from past citizen science projects; the best ways to encourage more researchers and volunteers to get involved; and the potential for using available and emerging technologies for data recording. 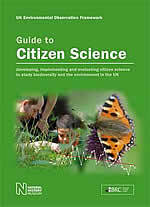 The Guide is underpinned by a comprehensive report, Understanding Citizen Science and Environmental Monitoring. This work was commissioned following two workshops on Citizen Science supported by UKEOF. If you have used UKEOF's Guide to Citizen Science or the report, please help us monitor its impact by contacting the team on office@ukeof.org.uk.